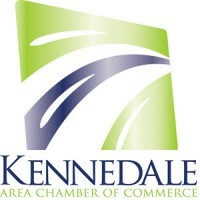 The Kennedale Area Chamber of Commerce is thrilled to celebrate and promote our members, and would be proud to introduce your business to the community with a ribbon cutting ceremony! You can host a ribbon cutting to celebrate a new space, recent renovation, new branding/website, new ownership, or just your new membership in the Chamber. There’s no bad reason to celebrate! Ribbon cuttings are included with all membership levels and our Ambassadors will work hand-in-hand with you to make it a successful event! Ribbon cuttings are held on Thursdays and Fridays, either at your location or the Chamber office, located at 205 W. Kennedale Parkway in Kennedale. KACC will provide the official ribbon and ceremonial scissors, as well as promote the event in our newsletter and on social media. It’s up to you to truly showcase your business and make it special! Many companies offer refreshments, tours, giveaways, product samples or demonstrations, and fun decorations. Make it a party and get people as excited about your business as you are! To schedule a Ribbon Cutting Ceremony, simply fill out this form and we will be in contact with you very soon!